Common goldfish are a long-time favorite as an easy first pet, which makes it extra surprising that they can’t actually be kept in the classic goldfish bowl. So what is a good home for our favorite orange friend? Keep reading for more info on how to keep goldfish, suitable pond mates, what to feed and how to breed them! This is a caresheet for single tailed goldfish. If you were looking for more information on fancy (double tail) goldfish, have a look at the Fancy goldfish caresheet. For more specific info on why goldfish should not be kept in bowls and small tanks, have a look at Why goldfish bowls should be banned! Carassius auratus, single tail goldfish. This includes common goldfish, comet goldfish, and shubunkin. The goldfish as we know it does not naturally appear in the wild. 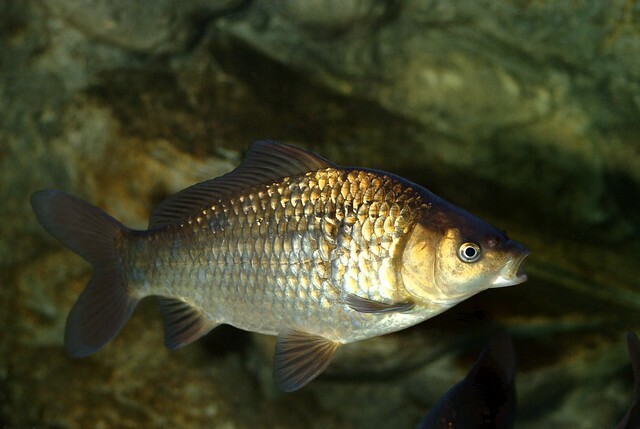 Its ancestor, the Prussian carp, is mainly found in Asia. Single tailed goldfish can be told apart from fancy goldfish by their tail (surprise, surprise), but also by their body shape. While some fancy goldfish types do have a single tail, they have a much rounder body than actual single tail goldfish. Single tails come in almost all colors, including yellow, orange, green/brown, calico and white. They have a long, torpedo shaped body that is similar to that of the Prussian carp and can grow quite large; up to 12 inch (30 cm) is sometimes seen! Determining the gender of a single tailed goldfish can be a challenge, especially when they’re kept in a pond. However, it’s not impossible! Most males grow small white bumps on their operculum and pectoral fins; it has many a beginning goldfish keeper worried about disease, but it’s actually just a sign that your goldfish is ready to breed. During breeding season, you’ll also notice the females getting much rounder and being chased continuously by the males. Single tail goldfish requirements come as a shock to many people. These fish can grow very large, which makes them unsuitable for life in a goldfish bowl or aquarium. Contrary to what most pet stores will tell you, they will not grow to the size of the container they are kept in. As mentioned before, if you’re wondering why exactly bowls and small tanks are not a good home for your goldie, check out Why goldfish bowls should be banned. So what is a good environment for your single tail goldfish to thrive in? A pond! Unfortunately, due to their size, activity level and need to live in groups, these fish are not aquarium fish. They should be kept in a pond year round with at least 2-3 other goldfish. The pond, at least around 300 gallons (1135L), should be filtered with a pond filter that has room for biological filter material or very lightly stocked and filtered using lots of aquatic plants. I’d recommend the first option, because it’s much easier to keep a pond balanced with a good filter. 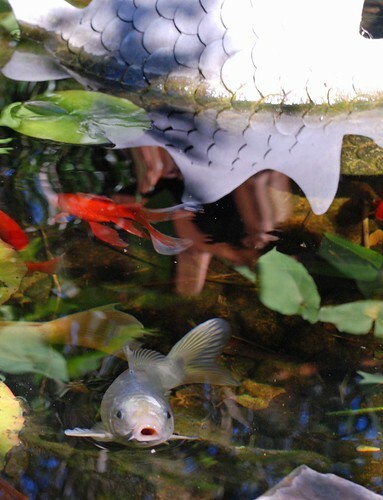 If you filter your pond well and go for around 100 gallons (380L) per goldfish, the fish will be able to thrive and grow to their true potential without the ammonia levels getting out of control. While I personally prefer keeping my goldfish only with other goldfish, there are a few options when it comes to pond mates. 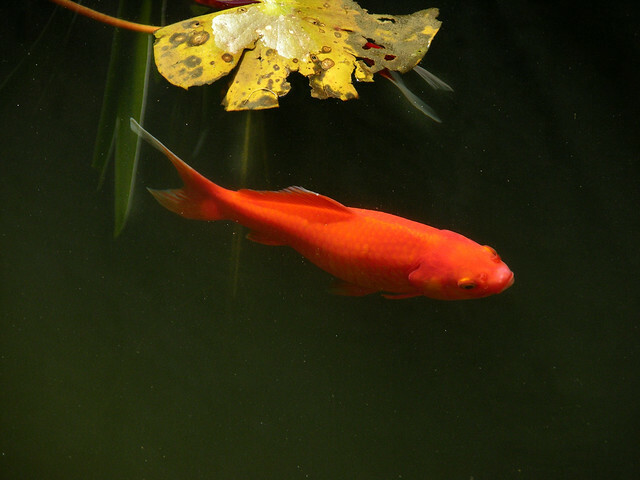 Many people keep goldfish and koi in the same pond; they are both peaceful species. 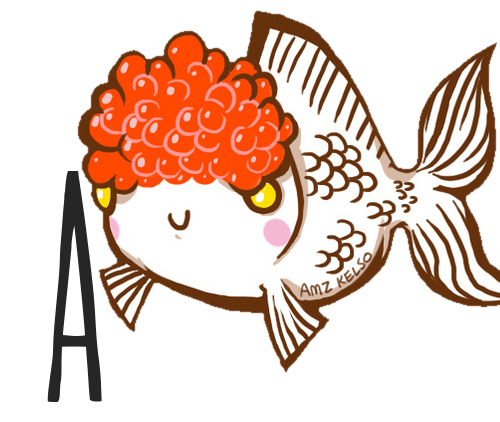 Just be sure you don’t add very small goldfish to a pond with big koi, and make sure your pond is large enough. Koi get huge and need a lot of room and filtration. You can find a koi caresheet here. Another option I like are frogs. Although I wouldn’t recommend adding non-native frogs to your pond, in a lot of areas frogs will appear in your pond naturally after a while. It took around 2-3 years before frogs and toads discovered our backyard goldfish pond and they’ve been thriving there with tons of offspring yearly ever since, despite the goldfish eating part of the eggs. If you’re looking for a smaller species to keep your goldfish with, consider mosquito fish! Many sources report no problems whatsoever when keeping goldfish with Gambusia species. Although mosquito fish live up to their name and do a great job at eating insect larvae, this may not provide enough food for them; be sure to feed them extra when necessary. Goldfish are omnivores that do best when fed a varied diet. In a pond, they can usually snack on algae, plants and insect larvae. However, a good quality staple pellet (I personally love and recommend Hikari Staple and New Era) is still very important. For extra variety, you can also feed frozen foods or blanched veggies like zucchini, spinach and lettuce. If you’re unsure when you should stop feeding your fish once winter comes around, check out this guide for more info. Goldfish, as mentioned earlier, are very social animals. When kept in groups, they will display typical ‘group behavior’ and stick quite close together, especially when scared. This safety in numbers is very important to prevent stress and stress-related diseases; if you keep a goldfish alone, it will instinctively feel unsafe all the time, which is obviously not too pleasant. Goldfish spawning behavior can get so rough it’s sometimes confused with fighting by beginning pond keepers. Keep an eye on the females so they don’t get damaged too much, especially when there are more males than females! The females are often chased around relentlessly until the eggs are released, which can cause injury. goldfish by riviera2008 on Flickr. Breeding single tailed goldfish in a pond is usually not much of a challenge. Once the fish are old enough to reproduce, males will start displaying breeding stars and females will develop a round shape. Once the water starts warming up in spring, the fun begins! Males start chasing females and bumping into them so the eggs are released. If you’re having trouble breeding your goldfish, be sure to add some plants to the pond. Goldfish like to deposit their eggs on plants, and this also helps prevent them from eating the eggs immediately afterwards. Fry can hide in plants and find food there until they’re big enough to enter the open water. And voilà! It’s as easy as that. Goldfish usually breed very quickly, so be sure you have a plan B to prevent your pond from becoming overcrowded. We have a goldfish pond in our backyard and I would definitely recommend considering one if you’re interested in keeping single tailed goldfish. Eating breakfast by the pond on sunny days and watching the fish eat their pellets and chase each other around is a lovely way to start your day. Note: Even if they’re breeding a bit too enthusiastically, never release goldfish into your local ecosystem. They are very damaging and dangerous to local species. In many parts of the United States, goldfish are a huge problem – Lake Tahoe is a great example of what can happen when aquarium/pond owners carelessly dump their goldfish. I’d take this over a goldfish in a bowl any day! If you have more tips or questions on how to keep single tailed goldfish, leave a comment below. Happy goldfish keeping! How to hand feed your fish! Hi! I’m adopting a single tailed goldfish, and he is very small and not yet ready for a pond. If I’m keeping him in a 50 gallon tank, what should the temperature e? When you say for the temperature seasonal, what do you mean?